It was out of deep love and dedication to sharing yoga with the community that inspired Radiance Hot Yoga owners Leah Johnson and Boaz Alperson to open their state-of-the-art studio in Glenmont. Both approached their first hot yoga class with a different mindset: Boaz figured he was in good shape so that class would be easy, and Leah worried that she wasn’t flexible enough for it. Regardless of their first approach, both found yoga filled a part of their lives they hadn’t expected. In each class, they built on balance and strength that was beneficial not only in postures, but in their daily lives, culling patience and willpower from their regular practice. Leah teaches Hot HIIT, Bikram, and Barkan yoga in both Latham and Glenmont. Boaz teaches Barkan, Bikram, and a new class, Intro to Hatha Yoga, in Glenmont. Join them and their other talented instructors in a class today! 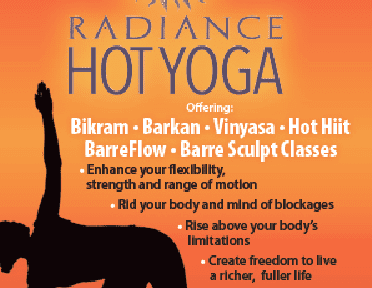 For more information about schedules or special events, visit http://radianceyogany.com/ and follow on instagram @radiancehotyoga.